DENTAL LABORATORY IN BANGKOK Our Laboratory has been open since 2009 to perform a full-service, commercially operated dental laboratory driven by a service centered philosophy and dedicated in offering the highest levels of quality and express service available for patients. Behind every great dentist stands a great team of dental technicians and ceramists. 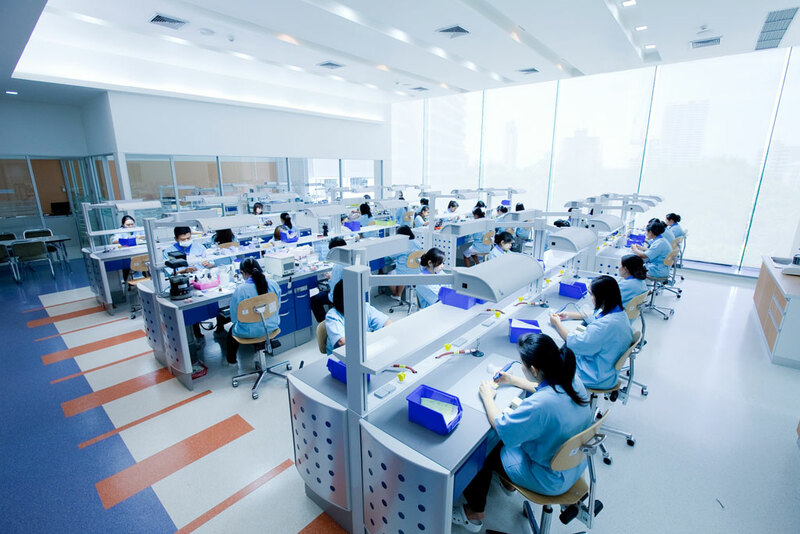 Our in-house dental laboratory is a great advantage for the patients of Dental Hospital. Instead of having to send out dental laboratory work on crowns, veneers, and dentures to offsite labs, our technicians are able to craft everything on site, and make small custom adjustments immediately, even at the last minute to make sure that you have the highest standard dental work and best possible smile. We are constantly kept up to date on high quality materials and new technologies in dental prosthetics and make them available to our patients. And because we have people on staff who work directly with crowns and other dental components, our prosthodontists and other dental specialists are able to call for the high quality laboratory work, modifications and adjustments that they are not delaying our patients in getting them. The Dental Hospital Laboratory features the latest products, services, and techniques available, as well as a knowledgeable team of technicians and administrative staff paying attention to detail while coordinating each and every case to be completed to the highest standard and on schedule. The Dental Hospital Laboratory uses an innovative and future-oriented CAD/CAM technology that provides dentists and laboratories worldwide with a complete solution, utilising only the best materials to produce dental restorations with precise fits and perfect aesthetics. Our success is based on our technicians who share a common commitment to innovation and skill, working together under strict quality control in an excellent work environment. The architecture and interior design carefully cultivate a relaxed, peaceful, welcoming, clean and professional ambiance surrounded by an outdoor beautiful garden. With an innovative and future-oriented technology, we take pride in providing the highest quality dental laboratory work, best value and exceptional service for dental practitioners.